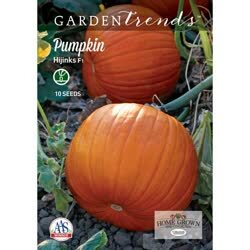 (F1) With some resistance to powdery mildew, this national, All-America Selections winner is very popular for those interested in carving or painting pumpkins. Hijinks has a very blocky shape with fruits averaging 7-9 lbs. Sow seed when soil is warm. Plants require full sun and even moisture. Sow seed directly into well worked soil and cover lightly. Water directly after planting to promote germination. 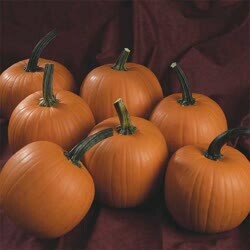 Small sized, 7 to 9 pound, globe-shaped pumpkins are ideal for fall decorations, painting and carving. 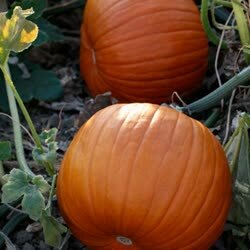 The very uniform pumpkins have smooth, deep orange skin, distinctive grooves and strong, durable handles to give them a classy appearance. The high yielding, vigorous vines spread up to 15 feet and are resistant to powdery mildew.